We are a small but very friendly group for anyone with an interest in horses. Any new members will be made very welcome. Join this group for lessons, hacks and treks and other equestrian events. Does any member know of another U3A who has a ‘horse-riding’ group? Please contact me (Margaret) if you do, because I think our little group is unique in U3A circles! Three cheers to our riders: Ann Parker, Dianne, Kath, Annilee, Ann Thomas ~ and making a very recent return, Margaret. Hats off to you all for your consistent perseverance! We welcome new members and people are welcome to come on any visits that we arrange. You will be given a warm welcome. New members, don’t be shy! We have all been there. For people who wish to ride weekly lessons and hacks have now reached on average three to four times a week. We continue the same days and times for lessons but the hacks and treks are dictated by weather. Please contact Margaret first to show your interest in any of the activities and for information/help regarding hats, footwear and clothing. Hats must reach the currant safety regulations. All riders must wear good strong flat shoes/boots with a small heel – sorry ladies fashion boots are out. Safety riding hats are provided by the riding schools, if you do not have your own, and must be worn. 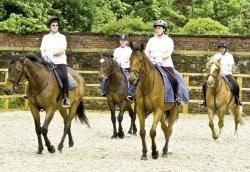 The weekly lessons are at Deandane Riding School, Gathurst Road, Shevington, WN6 8JB – a few minutes from the end of the M58 (north bound). We start our our 45 min lesson at 2.45 pm and the cost is £17 for 5 or more riders, £20 for 4 or less riders and £25 for an individual rider. Lessons cater for all abilities. There are both indoor and outdoor schools and in good weather a hack through the woods. We hack through Croxteth Country Park between 11.00 am and 12.00 pm, from the Riding School Centre in the park (Flint Drive). Cost is £19. Viv, Alex and Laura along with the staff make sure we are safe to go out and everyone is checked to enable a safe ride on your horse! There are various routes to take; good safe paths, wooded areas and nice, wide fields to walk, trot and canter. There is one open air school. There is an alternative group lesson at 2.00 pm called Leisurely Ladies! at Burrows Lane Farm Equestrian Centre, Prescot, Merseyside. L34 6JQ. The group caters from complete novices to more experienced riders and at £16 for one hour plus a cup of tea and a chat, is great value for money and plenty of fun. The outdoor arenas have all recently been resurfaced and in good weather we have fun in the grassed Working Hunter arena. Dressage (Intro and Prelim) and Jumping competitions for all client riders (of any age) are held throughout the summer. They also hold shows throughout the summer. The staff are all very friendly and you can contact Burrows Lane Farm on 07722 251652. New Hill House Riding School, Wood Lane, Great Altcar (very close to Farmer Ted’s) offer a Beach ride in the summer from the National Trust Car Park, Life Boat Lane, Formby, Sundays 5.30 pm-6.30 pm, cost is £30 per person and a”hack out” on the Cheshire Lines on Wednesdays at £25 p.p. per hour. Some of the group have been on these in the past. Contact Margaret for more details if you are up for a superb hour on horse back. Only experienced riders for this one please! From left to right: – Annelie with Ollie a 6 year old cob, a willing learner, Ann with Tommy a 7 year old cob who doesn’t like the rain, Margaret with Joey who has won many rosettes and Di with Socks a 6 year old cob who spends most of his days lying down. Annelie on Fred an 8 year old who his honing his jumping skills.